Explain the procedure to the patient and obtain a written informed consent, if possible. Explain the risks, benefits and alternatives (RBA). - What is the distance from the skin to the fluid? Usually 1 cm. It gives you an idea how deep you have to go with the needle before getting fluid in the syringe. - What is distance to the midpoint of the collection? Usually 3 cm. It gives you an idea how deep you can go with the needle in relative safety. Generally, the advice is as soon as you reach the fluid, to advance the needle just a little and then to thread in the plastic catheter, and to take the needle out. Explain the RBA (risks, benefits, alternatives) to the patient. Make sure that he understands and agrees. If the patient does not understand the procedure, he or she cannot provide an informed consent and you have to ask a relative who has a durable power of attorney for health care or is next of kin. Explain what is going on while performing the procedure, this will alleviate both the patient's anxiety and yours. Ask the the patient to urinate before the procedure or use a Foley to empty the bladder. Position the patient in the bed with the head elevated at 45-60 degrees to allow fluid to accumulate in lower abdomen. Get all the things ready at the bedside. Briefly explain to the patient what the different parts of kit are used for. Get a trash bin nearby to dispose of the plastic envelopes of needles and tubing. The patient should lie on his back in a slightly recumbent position toward the site of paracentesis. Percuss the area of dullness to ensure that is correspond well the the ultrasound marking. Insertion site is inferior to umbilicus and at the level of percussed dullness, usually 2-3 fingerbreadths below the umbilicus. Clean the area with betadine in a circular fashion from the center out. Apply the sterile drapes. You will place the opened parts of the kit on the drape. Open the 16 G Angiocath and syringe place them on the sterile drapes. Place the 1-L vacuum bottles nearby. From this point on, you have to wear sterile gloves, so please ensure that you have everything you need in the sterile area. It is time-consuming to have to reach for, let's say additional tubing in the non-sterile area and then to remove the soiled sterile gloves and to put new ones. Make sure that you have everything you need for the procedure in the sterile area. Try to make sure that the Angiocath fits the tubing. All needles, syringes and tubing should fit. If the marked site is in the RLQ, pull the skin down and go in with the Angiocath, then release the skin (this is called Z-technique which creates a skin track to stop ascitic fluid from leaking out after the procedure). Aspirate as you go in. Once you reach fluid in the needle, advance the needle just a little, then thread in the plastic part while withdrawing the needle. Aspirate again to make sure that the plastic catheter is still inside the fluid collection. If you get fluid in the syringe, everything is fine, unscrew the syringe and connect the tubing to the 1-L vacuum bottle. If you cannot get fluid after withdrawing the needle, try to reposition the catheter. If still there is no fluid, you can try to pull out and reintroduce the needle (if kept sterile). 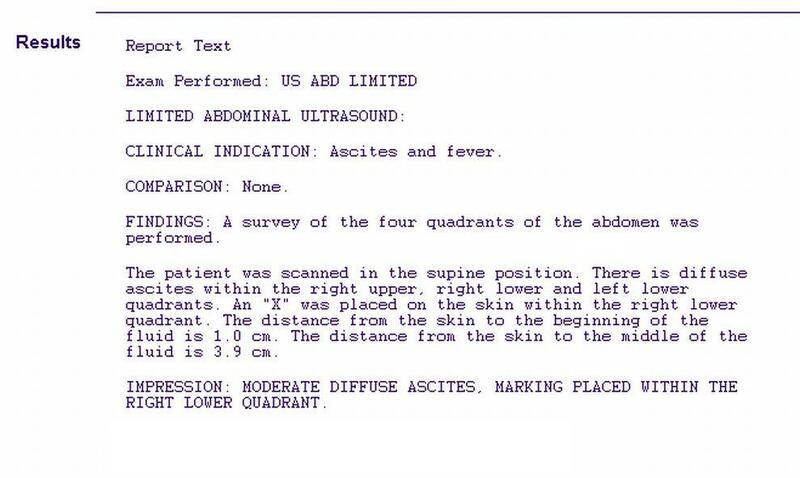 Do not push hard or deeper than the midpoint of the collection as seen on the ultrasound scan. 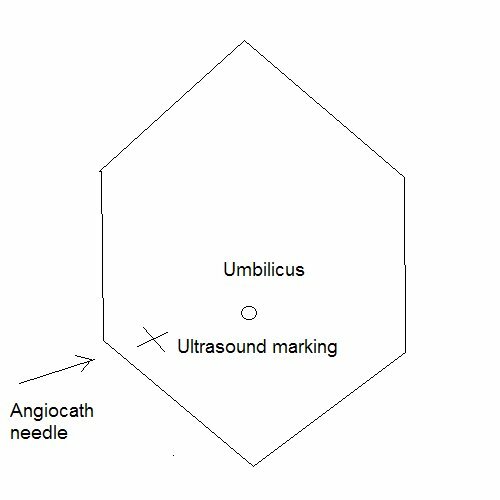 If you are unsuccessful in obtaining ascitic fluid, you can ask for an ultrasound-guided paracentesis. After the procedure, ask the patient to lie in his bed for 4 hours and the nurse to check vital signs q 1 hr for 4 hours to avoid hypotension. It is generally recommended to give 25 cc of albumin (25% solution) for every 2 liters of ascitic fluid removed. For example, if the patient had a 4-liter paracentesis, he should receive 50 cc of albumin IV (25% solution) over 2 hours. The rationale for giving albumin is to avoid intravascular fluid shift and renal failure after a large-volume paracentesis. Send the sample to the lab. Usually, you send only one of the 1-L bottles. The rest of the bottles (2-3, if it was a large-volume paracentesis) are disposed of in the biohazard area. Order the relevant tests and check them yourself or sign out for somebody to check them. Ammonia, CBC, CMP, albumin, amylase, lipase, INR/PTT. Your responsibility does not end with performing the procedure. You have to make sure that somebody follows on the test results and acts accordingly, e.g. prescribes antibiotics if the fluid shows SBP. Becoming a Rural Doctor, Part 5: Procedures for the Rural Doctor. Rural Doctoring, 2008. The material and/or content on this web site are for informational purposes only. Users of the web site should not act upon any information received from this site without seeking professional consultation. Click here for more information. Don't you need to anesthetize the site of entry? I really need to know more about this. Is this procedure an overnight stay in the hospital? And who all is involved in doing this procedure? My husband has severe pulmonary edema due to cirrohsis. His legs have finally gone down but now it is in his tummy area and his chest and he is having difficulty breathing. We are under a Dr. care as far as prescribed meds. But we are doing this with no health insurance at all. So you can see how difficult this is for us. He has been like this for just over a year now and we are selling just about everything we own to be able to pay for what ever he needs to keep him going. But that is definately not the issue. What I am trying to find out is if this procedure is ....time in the hosp. and if we need a specialist to do this for him. With the answers to that I can figure out the ballpark $ and set him at some ease. Whatever you can tell me would be great. Local freezing and that it! how many cc of ascitic fluid can be withdrawn on each procedure? I've never heard of anybody removing 11 litres at one go and this is certainly not recommended. 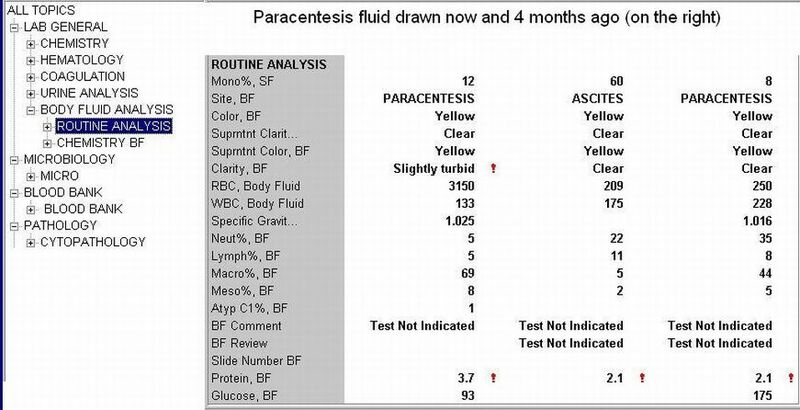 From personal experience, I had a total of 82 paracentesis. 2 each week. With each one they withdrew 4 - 10 liters each time. I did have to have albumin each time usually 100cc. Once when I was a crazy intern (first year doc. in Australia) I removed 18 Litres in one go without albumin replacement. Fortunately, there were no complications. I had removed 10-12 litres a few times prior (different patients), once again, without complication. 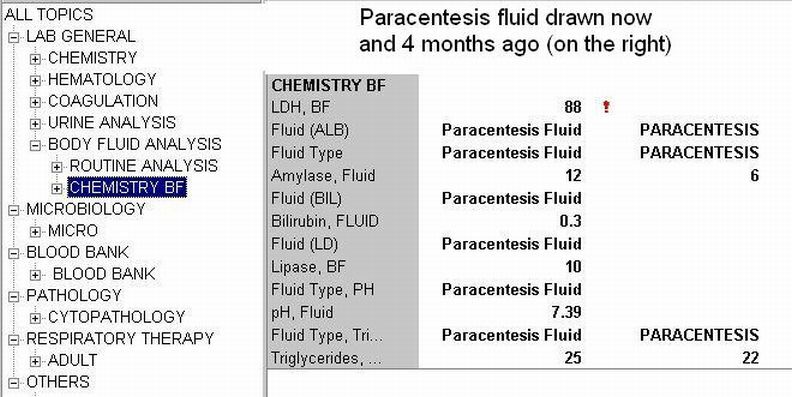 These days i just settle with a moderate 5 L paracentesis. 18L would not kill a patient or even harm a patient under most circumstances. There is a small risk so its usually not done all at once, and it's usually not necessary. If it is done (possibly to prep for emergency belly surgery? ), electrolytes, BP, albumin must be monitored and supplemented. I used to work 10 years in hematology-oncology department and I never seen more than 3-4 liters removed during abdominal paracenthesis. But my patients were kids and teens. From many medical sources I know that it is not recommended to remove more than 4-5 liters of fluid in one procedure. The safety of the patient is the most important thing. Plus albumin must be given as it said above - 25 cc for every 2 liters of ascitic fluid removed. Thanks for keeping the number one objective in mind. PATIENT SAFETY FIRST! The "crazy" examples above are not typical and not recommended. Please follow the guidelines above - listed in the references section. i think the article is so much beneficial thanks to who ever wrote it. this is gud information for priliminary purposes ..ofcourse experience counts..thanks for the information. What is the best "Needle" to use for paracentesis and what size/length? please provide pictures if you can. To remove 41 liters is too much by any standard and is not safe for the patient. One has to follow the standard guidelines in my opinion. any harm in giving too much albumin. My patient recieved 25% albumin that was actually 25grams in 100cc and a total of 6L was removed in one paracentesis. Prior to that she removed 4.5 L with no albumin given. I had read you are suppose to give 6grams with every liter above 5L of removed fluid. but you guys are saying with every 2L you are suppose to give 25cc or 6 grams of albumin. I hope my patient is okay? In terms of complications, how often would you hear of a major blood vessel being severed during this procedure? Check an anatomy book. 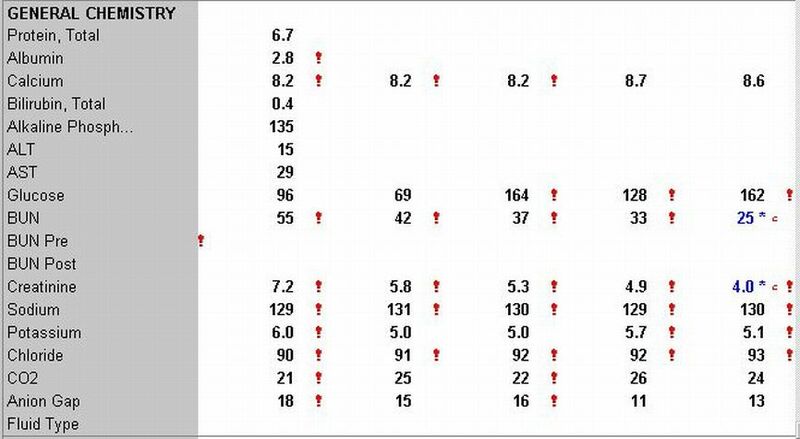 No major blood vessels if you locate correctly the punction area. "Only" bowels can be harmed if drilling too deep. Some small leaking of blood is common ( prothrombine level and thrombocyte count must be checked prior to punction). You can check the exact rates of this particular complication but it does not seem to be common. I've witnessed 22L and personally removed 17.5 from someone this week. I think the albumin guidelines on this site are overly liberal but something to keep in mind. long standing alcohol abuse.70% of all procedures are alcohol related there is a lot to read and learn.Standard hospice practice is to keep patient comfortable and remove the fluid so they can live out their life a bit more comfortable.As well as reducing complications of accumulating over 15L in your abdomen...Go figure better take it out that leaving it there.Mind the fact that the reason for Large volume removal is continued drinking in the majority of cases. Should tis ever be performed at home? We were victims of Hurricane Katrina and were sheltered at home without medical help available. If this were to happen again, I would consider a trained family member performing it if we had a kit. Let's be serious now - you NEVER do this at home. Go to the hospital, ER, etc. and see a licensed doctor. I know someone who has 8 - 10 liters drained every week (with albumen). First drain was more than 16 liters. This patient has not had a drink in about 1 1/2 years. I don't suspect it will get better. Could I be wrong? AASLD does not say albumin is a 'must'. It states that it is reasonable to give albumin over 5 liters. There is no evidence of clinical benefit giving albumin, Sarah. is it therotical to send sr.protein and albumin level in patient in whom >5 liters of ascitic fluid is removed and patient is in hypotension later??? ?one of the senior who is psychologically ill scold me because i send sr.protein and albumine level after procedure and patient was having hypotension. Patient s/p paracentesis with 11 liters removed received 100 cc of 25% solution Albumin over 3 hours and IV 0.9 NaCL @40 cc/hr. Developed severe hypotension 3 hours post procedure requiring Dopamine Drip and transfer to ICU. Would administration of Albumin concurrent with paracentesis possibly prevented the hypotension? Removed fluid volume depends on various parameters I think. E.g. patients weight, blood pressure at starting the whole procedure, serum albumin level, intraabdominal pressure (e.g. more fluid in less space can produce higher intraabdominal pressure , relatively small volume removed causes more pressure dropping and vessels of intraabdominal organs can dilatete more can cause serious complications). And of course patient with 130kg's with 25L's of ascites can tolerate more volume removing than a 50kg's patient. So you must think of many parameters before decide, better removing fluid in more steps with some pauses. The more protein contains the ascites fluid ( e.g. containing much leukocytes or other source of proteine) the more osmotic pressure is generated and the more albumine replacement is needed to keep fluids in intravasal volume. In most common cases ascites is a symptom of hepatic disfunction with parenchymal (e.g. serum albumine production) and vascular (e.g. hepatic hypertension and hepatic veins dilatations) decompensation (not mentioning now other cases e.g. peritoneal tumors etc.). Replacing low serum albumine prevents osmotic pressure difference and prevents intravasal fluid exiting to abdominal space re-generating the ascites. Not every patient needs albumine replacement. Personally I have done many paracentesis removing 5-6 L's by one time without administrating albumine without any complications. How much time per litre of tapping is ideal? One of my patient go 5 lt. Tapping in 25 mins by a gastroenterologist from Punjab .next day she became hypotensive. Does the needle go into the stomach itself? Can this procedure diagnose stomach cancer or liver cancer? Basically can it rule out cancer anywhere in the gastric area?